Adam Smith (1723-1790) - Scottish economist, considered "the father of modern-day economics". Adam Smith lived at a time referred to today as the Scottish Enlightenment. He was one (probably the most prominent) of several individuals from Scotland who made important contributions to math, science, philosophy and the arts. Born in the town of Kirkcaldy, as a student he attended the University of Glasgow where he was educated by Francis Hutcheson who is generally considered to be the founder of the Scottish Enlightenment In 1748, Smith began lecturing at the University of Edinburgh, and two years later met David Hume (another figure from the Scottish Enlightenment) who would become one of his closest friends. Those two men, Hutcheson and Hume, would be two of the most influential people in Smith's life. In 1751, he received a professorship to teach at his Alma mater in Glasgow. At this time he was not considered an economist, he taught philosophy and logic. As his tenure progressed, though, he began formulating his ideas on economic theory. He observed, for example, that a nation's wealth is derived from its workforce and the quantity of goods and services it produces, not the accumulation of resources often at the expense of rival nations, which was common among the European powers at the time (an aspect of Mercantilism). 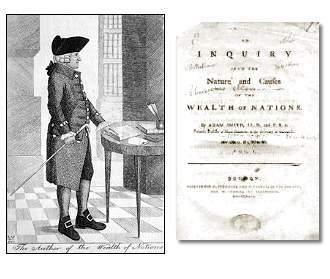 He laid out his macroeconomic principals in his work, "An Inquiry into the Nature and Causes of the Wealth of Nations" (usually referred to simply as The Wealth of Nations), which was published in 1776. You can start to see why this period in history is known as the Early Modern Era. This is the time in which many great thinkers laid the foundation for the modern world in which we live; scientifically (Newton), politically (Locke) and economically (Smith). Besides his Wealth of Nations, Smith also wrote The Theory of Moral Sentiments in 1759. Although not as well known today as his other great work, it was popular in his lifetime and made him a highly respected mind in Europe. Whether it was coincidental or the two are somehow related, it's interesting that Smith's life intersected with the birth of the Industrial Age (see below) which provides us with a practical example of how labor, productivity and markets impact societies.